What's the Difference Between "Plain Text" and "HTML" Email? - Ask Leo! Email can be sent in several formats, the most common being plain text and HTML. We'll look at the difference, and which might be preferable. I tried posting to a moderated email discussion group I’m on, but my post was rejected because the moderator said it was “html”. They wanted me to switch to “plain text”. What are they talking about, and how do I do it? HTML stands for HyperText Markup Language. It’s the way web pages such as this one are encoded to handle things like bold, italics and even color text red. Plain text is, well, it’s plain. There are reasons and times you might want to use both. Switching isn’t hard, if you know where to look. Of course, where you look depends on how you send your email. In the beginning (so to speak), there was plain text. Quite literally, plain text is text, and only text, along with a couple of simple representations for things like end-of-line. HTML started as a way to describe how web pages should look. It includes ways to specify formatting, colors, positioning, and some amount of layout. As email became more popular, people started wanting to make their messages “look” as nice as they felt web pages looked. They wanted that formatting, the ability to put in pictures, and the like. You can see that the HTML format is quite a bit longer than the plain text form. It has to be, to include all that additional formatting information. One important thing to know about HTML format used in email is that not all email programs know how to interpret it. Almost all do these days, but a few stragglers do not. Quite the mess, right? Extremely difficult to read, right? In particular, some mailing list services don’t handle HTML properly or can be configured to reject it, which is probably why your mailing list moderator has asked you not to use it. You can set a default for all email. You can change the format of the current message as you compose it. Exactly how you do this (or if you can, in fact, change the default) will vary based on what mail program you’re using. I’ll show how to do both in Outlook Express as an example. 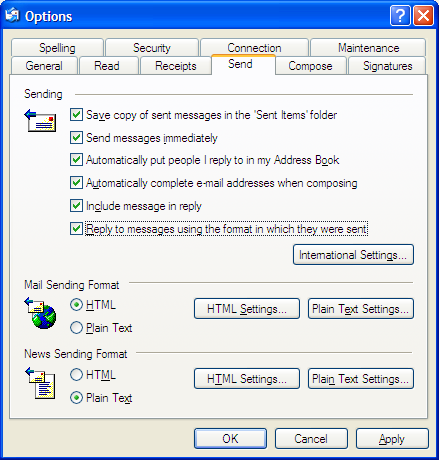 Under Mail Sending Format, select HTML or Plain Text as appropriate. The appearance of your message will probably change, and if switching from HTML to Plain Text, you may get a warning that you’re about to lose your formatting. Unless there’s a requirement – for instance, with your mailing list – it really depends. I really tend to favor plain text email. The focus should be on the message, not how “pretty” it looks. Plain text email is smaller, delivers and downloads quicker, and is also much less likely to be erroneously marked as spam. Personally, I don’t really see a need for lots of cutesy images and stationary – to me, they just detract from the message. In cases where people have images blocked (which is the default for many email programs) the message actually looks worse, as the images are replaced by placeholders. On the other hand, some people do want their email to look richer. You’ll see a lot of businesses using HTML email to make their message look more formal, more professional, and often much more in line with their corporate image. Why does this email message ask me to enable HTML when it already is enabled? - Viewing an email in HTML seems to be the default in the new Outlook.com. There is no easy way to change it. So why are you seeing this message? Why Doesn’t My Email Format Properly in Outlook? - Outlook's email formatting can occasionally cause issues when viewed by others. I have a couple of suggestions on how to reduce the problem. « Previous post: How can I enlarge a PDF for printing? how can i set my yahoo or gmail to be receiving emails on plain text only? 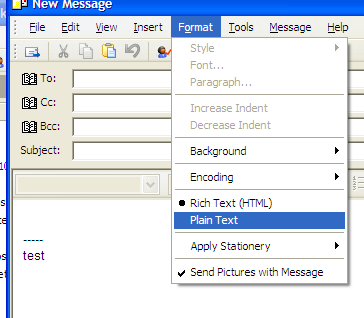 To change the current format of a message click on the Format menu, and then make sure that the format you want, Rich Text (HTML) or Plain Text is selected:” Unfortunately, my register must be off because those choices, “Rich Text (HTML), or Plain Text, are grayed out.I don’t have the option to change. I did before but now I cannot open any hyperlinks sent to me in Outlook Express. I’m trying to set up a computer for someone who is having vision problems and needs larger fonts for both sent and received email. It seems like a simple thing to do for email that is being composed and sent, but I can’t seem to manage it as a default for email that has been received. I’ve tried in Outlook and Mozilla Thunderbird. No luck. Would you have any advice? If you’re setting up a computer for someone who needs things bigger, I wouldn’t focus on just one or two applications, but rather the entire system by changing the DPI setting: How can I make the text on my screen larger? I am using MS Office and wife is using Outlook Express. Both emails are now receiving HTML emails but not converting to plain text unless we do so prior to forwarding; and then pics are deleted. Is there a setting that has been changed that I cannot find. I agree with your preference for plain text, though for different reasons. I would not mind pretty email. But I find that the quoting system in htlm email does not always work. > the quoted text is on a line with an greater than sign at the beginning. Tim> This is a line written by time. Either of these designations of what texts is quote is very useful, if not essential. In html email however the quoted text is placed on lines formatted such that they begin with a horizontal bar. and seeing it also removed from places that I do. avoid having to read 20 inch (?) lines of text. line feeds into the text and not just to keep typing on and on adinfinitum. | html quoted text looks kind of like this. I appreciate the thoroughness of your explanation of the difference between HTML and plain text. When I googled your page came up. Nice Job! By the way I opted out when the window popped up to sign up for emails of other helpful tips but if you could include me I would be grateful. Is there a way to unscramble those illegible emails? The sender, who emails lots of articles, says I am the only one who has a problem reading his emails. At least, nobody else has complained. His personal emails are perfect. It’s those that he forwards from other sources that are garbled. This has begun recently. What to do? It depends on what email program you use, and exactly how the message is garbled. It’s supposed to just work, but as you can see that isn’t always the case. In an email program I was pretty confused to send a mail whether in “Text” format or “HTML”.HTML format was not working properly.Then I switched to “Text” format found it works and later sent the mail.But I was having a doubt in my mind that whether the recipient got it properly.The system shown your formatting might be changed. Reading this extremely helpful article on Mail format clears all my confusion.Thanks a lot. Outlook Express has so many problems and is no longer supported by Microsoft. The best solution would be to switch to another emial program such as Thunderbird of MS Livemail. I thought this may be of interest. My wife’s O.S. is XP & Mine Ws 7, with O email. For a long time she was unable to open, or see any attachments sent from my lap top which is set up on HTML. Eventually I changed my format to Plain Text when emailing with attachments, problem solved! Question: I have Microsoft Outlook as part of Microsoft Office 2010. All plain text email messages that I receive show a blank page. Nothing shows on my screen. Previously I could see the words if I right clicked and hit “reply”. But now that does not work. I use Windows 10, but when I used Windows 7 I had the same problem. Can you help me fix this? I am receiving important messages in plain text and must read them on my phone. I’m stuck. Thank you. I use WindowsXP as my software….while “dated” I have no need or desire to relearn a newer version or MS software. All of my emails-ads-promos were arriving in “plain text” and printed out in the text style I use routinely (ARIEL). Some 3 months ago, “inbound” Commercials, Promos, Websites informing, selling, or providing information began arriving in “HTML”….why I don’t know? I made sure my ‘TEXT” choice in the “MS Word” file was set to PLAIN or RICH text only, but it failed to fix the issue !!!! My outgoing mail is sent using the same aforementioned type selections and appear to arrive as such properly ! How do I fix this issue ( inexpensively if at all possible, I’m on a limited fixed income). Many of the”help” links and sites all offer help but at a fee……Most times directions take you into the “bowels” of the program and software. I could likely follow a step by step instruction guide…but the “helpers” speak in terms which many times is “Martian” to me the lay person. Microsoft offers zero help ( including their LIBRARY) where they point you to, but where do you start?, what is the title of the issue?…. Along the same lines…. The link to the WINDOWS HELP & SUPPORT on the desktop to “backup a specific date when you have added, deleted, or modified some program of function(s), has disappeared, not to be found!!! Frankly, as you can read, I need help big time ! I dread having to do a rebuild as my unit is like an “old friend, slippers, significant other which you come to understand, accept, acquiesce to & for……. Your guidance please. TYVM…. I’m confused. The format of email sent to you is controlled by the person sending it, not your settings. You did not explain the pros and cons between Rich Text and ascii messages. In the section “Which should you use?” Leo touches on the pros and cons. He said it mainly boils down to personal choice. In most cases, there’s no major difference other than esthetics. I personally tend to use html rich text mainly so I can highlight a word or two or use a block quote. I use html pretty much to send plain text style with a few highlights. I sometimes use html templates to send out holiday mailings which I prefer to using greeting card websites. That used to be easy in Outlook Express which had built-in templates, but now you do a little layout work yourself to do it. Very well explained! Also pics to show what to look for. Excellent job! I sometimes receive HTML e-mails which do nothing fancy with the HTML and use the HTML mostly to significantly increase the size of the e-mail. This is stupid and needs to stop. Just use text/plain instead of text/html if you are not going to use the HTML for any real benefit anyway. Considering that computers and email servers have so much space available, the increase in bandwidth used by .html email is insignificant. I send all of my email as .html because sometimes I like to format it differently with quote blocks, bold, italics etc. For me, it’s much easier to keep .html as the default email format as it really doesn’t affect much. If you use an email program which doesn’t render .html emails, you might consider switching to one like Thunderbird which renders it very well.